One thing is certain. By the time you’ve reached the outskirts of Gatlinburg, I’m sure most tourists have noted that they’re sure they have seen maybe a hundred pancake houses. Well, they have the Pancake Pantry in Gatlinburg to thank for that. The Pancake Pantry is the first specialty pancake house in Tennessee, opened by fellow vacationers Jim and June Gerding in 1960. It is now advertised as a Gatlinburg tradition for 55 years and counting, but it would be nothing without the hard work and outstanding quality of the food that’s delivered to hungry customers every day. My wife and I skipped this place when we first visited town in 2011. When we tried the Pantry for the first time in 2012 before a hiking trip, we regretted not visiting the previous year. I guess we were turned off by the long lines, and we hadn’t planned on getting up at the crack of dawn to beat the crowds (highly recommended by the way). 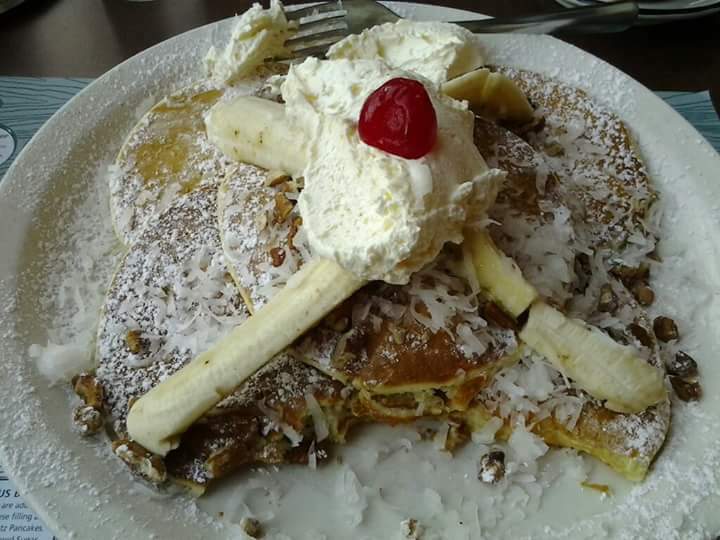 We have visited four times now, and I must say the best pancakes are the Sugar and Spice Pancakes (Our waitress last year said they are one of the top sellers). I can also check off the Wild Blueberry Pancakes, the Sweet Potato Pancakes, and the Caribbean Pancakes; the latter is shown in the picture. The service has been somewhere between good and great, but like I said earlier, we arrived shortly after 7 when they open in the morning, so fair warning to those wanting breakfast here after 8; the lines are long and you are crammed inside. I have not partaken in anything other than pancakes, so I cannot speak for their eggs, french toast, meats, nor crepes, which aren’t real pancakes in my opinion. 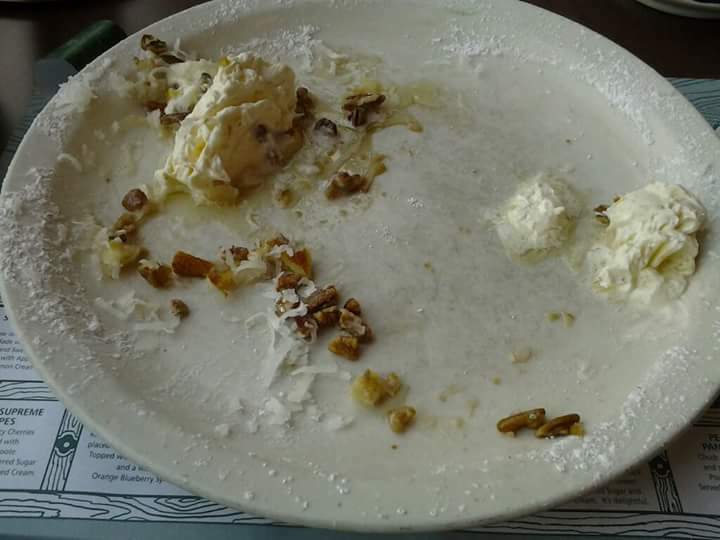 The price for pancakes is reasonable, given that you are served five large, fluffy ones sprinkled with powdered sugar, and a mound of whipped butter globbed on top. Believe me when I say if you can finish these, you are good for awhile on food. They also have a lunch with sandwiches and soups that the locals rave about as well. My only complaint is the glasses of milk and orange juice come in kid sized glasses, and you will be charged double for refills despite the small amount you receive. Your best bet is coffee, if that’s your morning routine. Your cup is rarely empty before they fill you up again, and it’s one price. My final word of caution is they are still a cash only establishment, which is a common complaint, but there is an ATM inside, and I’m sure their business has yet to be affected by this, given the daily long lines to eat here. Take my opinion for what it is, but there is no finer place for pancakes than the Pancake Pantry. Anyone that does scratch-made pancakes this good, absolutely should have the word in their name.